Poker Book Reviews for Texas Holdem, Omaha, Tournament, Strategy & Cash Games. "Super System" was the poker book that educated a generation of No-Limit Hold'em players. It's author and legend, Doyle Brunson often claimed the secrets he shared in this 1979 book cost him considerably more than he got for writing it. However in 2005, more than 25 years after the release of the original and when online poker really kicked off, Brunson returned with a new book "Super System 2: A Course in Power Poker". Rather than being a replacement to the original, "Super System 2" is a new volume with strategies for modern poker variants and follows a similar format. It opens with a section covering Brunson's past both on and off the felt, along with an update on what has happened to him since 1979. A group of top level pros then add their own chapters on their specialty games. Jennifer Harman writes the part on Limit Hold'em, Bobby Baldwin is back looking at Omaha Eight-or-Better this time, Todd Brunson handles Severn Card Stud High-Low, businessman Lyle Berman describes Pot Limit Omaha and finally Daniel Negreanu explains Triple Draw. Doyle's No-Limit Hold'em chapter from the first book is added in, with only a few minor alterations. "Super System 2" also contains several new mini sections as Crandell Addington provides a brief history of Texas No-Limit Hold'em, Brunson shares his thoughts on Online Poker and Mike Caro returns with a presentation on basic poker concepts from the Mike Caro University. Prior to the strategy chapters Steve Zolotow explains why a player should learn different games, then the book is finished off with a few pages devoted to Tournament Poker, a format which has increased massively in popularity since the first "Super System" came out, before the story of the World Poker Tour is told in the final chapter. In many ways "Super System 2" is a celebration of poker's rise in popularity and is a delight to read. It is not just Brunson's story this time, the book also covers how the industry has matured to attract a global market. Like the original "Super System" the strategy chapters feature some of the best information you will find on current popular poker variants. It is slightly disappointing to see there is little added to Brunson's No-Limit Hold'em section and some smaller chapters, such as the one on Online Poker feel forced and distract from the overall flow of the book. 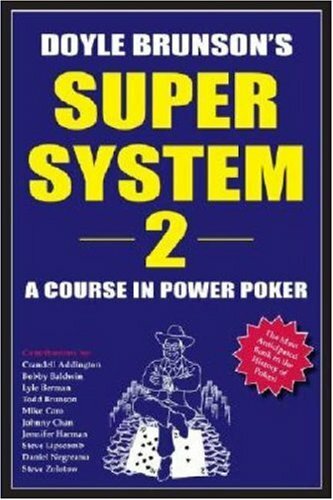 However overall "Super System 2" offers a fascinating insight into the poker world and is great resource for anyone playing modern mixed games.